Often called “the heartland,” and also said to consist of “fly-over states,” the Midwest of the U.S. has been “red”—or Republican—in presidential elections since 1968. But what is life like there? In The Quonsets, comprised of two joined plays, first-year Yale School of Drama playwrights Majkin Holmquist and Alex Lubischer take us to their home states of Kansas and Nebraska, respectively. The title comes from the setting: temporary structures, used as sheds and shelters, in the farming communities of the Midwest. Inside the Quonsets, two one-acts take place as dramas among three different persons, with the fourth character in each provided by the same Custom Cutter (Rachel Kenney), a nomadic worker who provides special services to farms. The Custom Cutter introduces the action and provides comments between the acts. Her story is she had a partner who was an artist, and lived for a time in Chicago, but chose to go back to her birthplace. She lays out the basic situation: she wants to farm but has no birthright claim to land. So she becomes a migrant worker, taking jobs where they can be found, as a kind of freelance farmhand. Kenney’s accent and manner take us into the CC’s world, and her playful designation of natural occurrences—cows in a field, for instance—as “installations” lets us know she has a certain irony toward both worlds: the plain folks of the farms and the sophisticates of the city. In the first play, in Kansas, two hard-working siblings, Cassidy (Stella Baker) and Clay (Gian-Paul Bergeron) take a break from a 27-day stint of fieldwork due to rain. Sheltering in a Quonset, where the CC is trying to get some shuteye, the two banter about a visitor Cassidy is expecting. A rising sophomore at KU, she’s expecting a fellow student—“he’s not my boyfriend!”—to come calling. When Sylvester (Ben Anderson) does arrive, he’s clad in threads just a notch below a rhinestone cowboy. This, along with his name and his general condescending cluelessness about farm-life, immediately earns Clay’s mockery. Most of the play is simply the one-upmanship between Clay and Sylvester—or “Sly,” as the CC immediately dubs him—while Cassidy is placed in the unhappy position of trying to placate both. The main point of the play seems to be making the “fish out of water” position apply to someone who considers himself more educated and sophisticated then his grudging host, Clay, who bristles at Sylvester’s ingratiating manner. 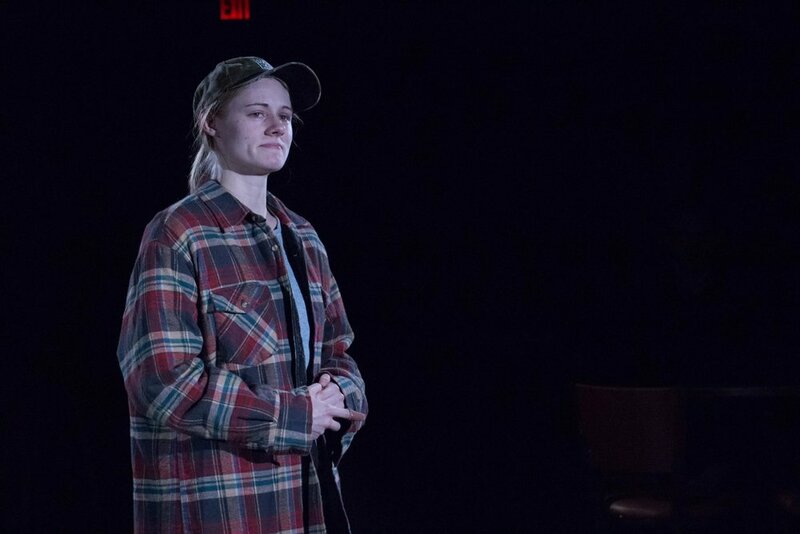 What Cassidy experiences—in a nicely subtle performance by Baker—is the disjunction between life in college and life down on the farm. How she will resolve the two isn’t clear but only the CC—a much older character—takes pity on hapless Sylvester. In the second play, Baker transforms herself into Barb, a mom and wife concerned that the business her husband, Dale (Bergeron), is running with his business partner/brother, John (Anderson), has been putting unfair financial burdens on the couple. A recent drought and its effect on the crop and their earnings has put them in a vulnerable position, which John solved by selling their combine. Which means hiring the CC, who is present again, waiting to get paid while the brothers and Barb try to sort things out. The undercurrents in the family dynamic, as they slowly surface, are handled well, particularly when we learn of Barb’s fears about a recent violent act of her son. The tensions, mostly resolved by a heart-to-heart, show the strain of business on family, underscored by the difficult arrangements of living year to year. Director Aneesha Kudtarkar keeps the pace steady in these conversational plays where interactions can veer from casual to tense in a heartbeat. The actors manifest, in the first play, the awkwardness of the outsider trying to break the ice not very successfully, and, in the second, the awkwardness of a family dynamic where Dale has to negotiate a certain gray area between the expectations of business partner and life partner. It’s a tough row to hoe. As a peek into a rural world and farming as a difficult way of life, The Quonsets sticks to the basics of real lives. The Custom Cutter’s monologue in which she sees Barb as reminiscent of a figure in a painting at Chicago’s Art Institute hints at the poetry of the everyday, even as Barb’s musing reflection on her place in the humdrum scheme of things yearns for access to something else. Morals may hang in the air, but, in these parts, they are neither grim nor comforting. That’s just the way it is.